What's the last thing you crafted, constructed or created yourself? I am not very good at crafting and since I live in a one bedroom apartment in Manhattan, I don't really have space to craft much anyway. As for construction, I'll have to say it is the rebuilding of the wardrobe shelf about a month ago. For creating something from scratch; ecto for Windows, my software, is my most recent and proud creation. But this QotD reminded me of something I once assembled/created, and which I am very fond of and probably want to do it again. 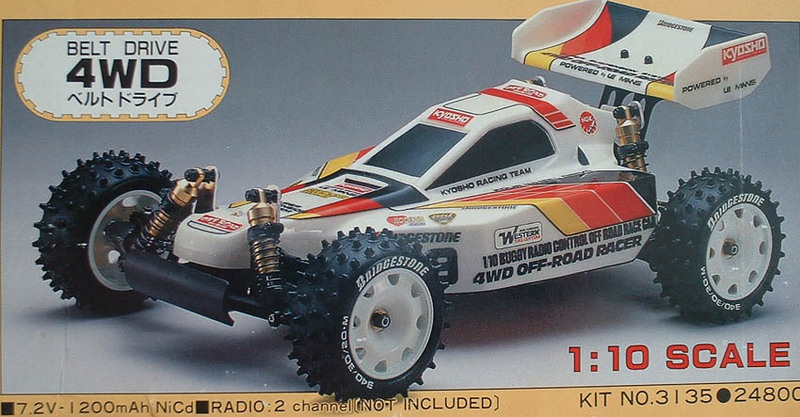 Once upon a time when I was still a kid and lived in Hong Kong, radio controlled cars were all the rage and I wanted one because couple of the kids in school had them. After badging my mom for nearly a year, she finally relented and allowed me to get one. Not knowing what make was good I bought the one that was in my limited price range and that had a look I liked. 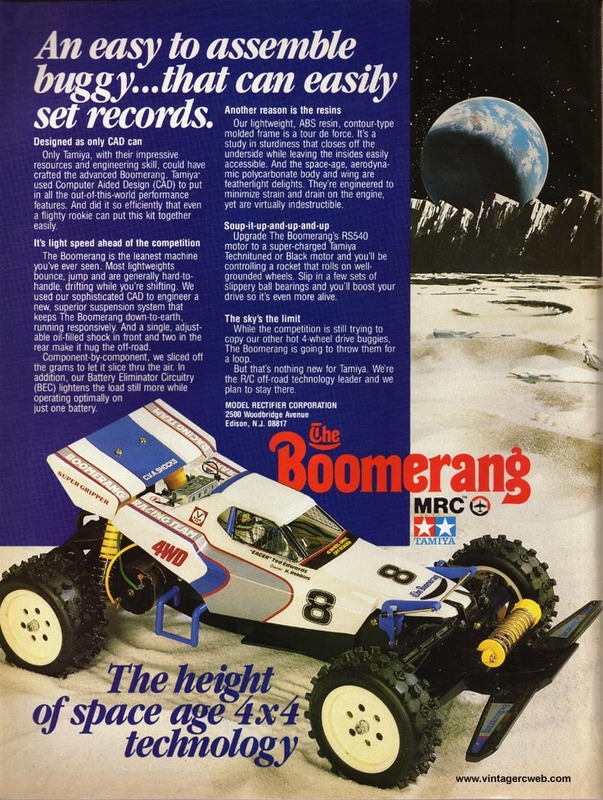 The Boomerang from Tamiya was a 4WD electric radio controlled buggy. It was a model kit so assembly was required, and I must have spent a whole week during the summer meticulously putting each piece together. And every night I lie on my bed dreaming up the colour scheme that I would paint the shell. When it was finally finished, I was so excited. However, after having raced it against my friends' buggies the shortcomings of the design were very obvious. First, the battery was housed internally and was 7.2V (i.e. 6 x 1.2V rechargeable battery). Compared to the Kyosho which had a open bottom tray and could be easily modified to take an extra battery, making it 8.4V, and hence more electric power and slightly longer run. The other major issue was that because the whole chassis was molded plastic, in contrast with Kyosho which had a open two floors design, the Tamiya did not lent itself to customization. So very little adjustment of the wheelbase, camber, toe-in/toe-out, etc. And finally the Tamyia used a drive-shaft system to power the 4WD and this meant extra weight and less easy to change gear ratio. So I more or less started saving again to get a Kyosho. I can't remember how long it took me but it must have been at least a year, if not two. This time I went for the Kyosho's mid range model (again, I couldn't afford the top of the range Pro model), Turbo Optima Mid SE. With the previous experience behind me, I was able to assemble this car within two days. This was so much more racing oriented. I could adjust almost every aspect of the suspension, gear ratios, etc. And there were tons of custom parts to 'pimp out' the car. The first thing I did was to replace the heavy metal base chassis plate with a carbon fibre one. Then I replaced the rear lower wishbones to lengthen the wheelbase so it would have more stable handling. Other things that I customized: lighter and longer rear drive shafts, form tyres and lowered suspensions and higher viscosity suspension fluid for indoor racing, and fine pitch gears for better and smoother power delivery. The most drastic customization turned out to be one that I performed all myself. In an extreme quest for weight saving, I started taking away part of the upper chassis floor. First I drilled holes to make it perforated. Then I slowly trimmed its shape to the slimmest possible with a heck saw without compromising the chassis rigidity. My friends and I even went to a tournament and raced our cars against other, much older, racers. I did not win, of course, but it was a lot of fun finally putting the car through its paces. Unfortunately by that time I had moved on to secondary school and lost touch with my friends in primary school. I carried on playing with in for another couple of years before I moved to the UK. I made one last effort to continue this hobby but as with most thing in the UK, radio controlled cars' parts were so expensive that there was no way I could afford it. Eventually the car was left gathering dust in the garden shed and never been seen again. 😦 I wished I had the foresight to take photos of these amazingly fun cars but alas I don't have any photos to show. Hey buddy! Maybe you can tell me – is it possible to post to vox using ecto ? If so you have a customer waiting. No, it is not possible right now. 6A has not exposed an API for 3rd party client such as ecto to access Vox.